Preheat the oven 180ºC, gas mark 4. 1. Grease and line the base of 2 x 22cm round cake-tins, with non stick baking parchment. Place the butter and 250ml of the ale together into a pan and gently heat until the butter has melted. Cool slightly. 2. Sieve together the flour, cocoa and bicarbonate of soda and add the sugar. Whisk the butter and ale mixture into the flour mixture, adding the milk, eggs and vanilla. 3. Spoon into the prepared cake tins and bake for 20–25 minutes. Transfer onto a rack and allow to cool to completely. 4. To make the Icing: beat the softened butter, gradually adding the icing sugar a spoonful at a time. Once all the icing sugar has been added, whisk the icing for about 5 minutes on a high speed with an electric whisk until light and fluffy. Then add 25ml of ale and mix. 5. Melt the chocolate and marble through the icing. Spread or pipe half the icing onto the bottom layer, top with the other cake, spreading the remaining icing on top. 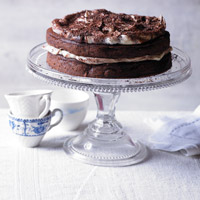 Finish with a dusting of cocoa powder or lots of grated chocolate!